The related content feature allows you to link different content pieces together. 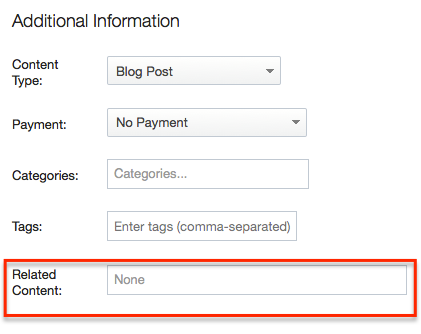 This feature can be useful for organizing localized content. For example, lets say you have a created a webinar. You also know that, somewhere in your Kapost instance there exists an eBook and blog post that relate to that webinar. Now you can link those up and have a visual reference on the content page itself. This is an auto-complete enabled field. This just means that when you start to type the title of a related piece of content, our system will recognize it and create the link for you. Link as many pieces as you'd like.